There is no global corruption that they are not behind"
The Jews are "the people of falsehood"
"Among the Jews we find nothing but corruption and depravity"
A judge in the Palestinian Authority's Islamic court system taught that Jews "dance and live on the body parts of others, and on the blood of others," and that "there is no global corruption that their rabbis did not allow." 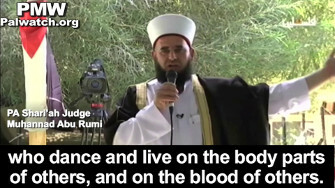 The Antisemitic Shari'ah Judge, Muhannad Abu Rumi, spouted this hatred on official PA TV earlier this month. Muhannad Abu Rumi: "[Khan Al-Ahmar is] holy land. We know its value, and not them [Jews], the foreigners, the fabricators of history, who dance and live on the body parts of others, and on the blood of others. Read their history: There is no global corruption that they are not behind. 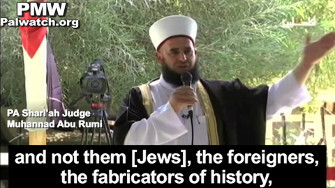 There is no global corruption that their rabbis did not allow..."
Later in his sermon, Abu Rumi echoed Mahmoud Abbas' advisor on Religious Affairs Mahmoud Al-Habbash, who has stated that the conflict between Palestinians and Israelis/Jews is the battle between "good" vs. "evil," and that Israel represents the "culture of Satan" in the battle against "Islamic culture in all its splendor and human glory." Muhannad Abu Rumi: "The war is not only over this strip of land, as you all know the Jews want everything and not just a part [of it]... 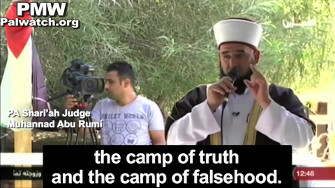 There have always been two camps in history: the camp of truth and the camp of falsehood. The people of falsehood see themselves as those who rule over everything... 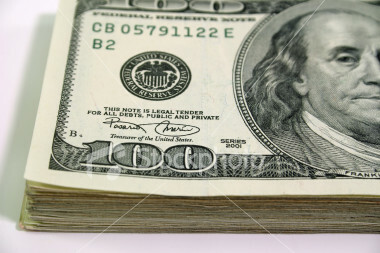 Among the Jews we find nothing but corruption and depravity." 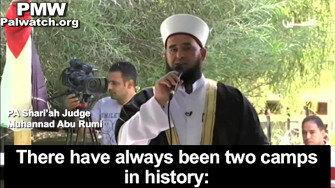 Both Al-Habbash and Abu Rumi serve as Shari'ah judges in the PA's Islamic court system. Al-Habbash is Supreme Shari'ah Judge and Chairman of the Supreme Council for Shari'ah Justice. It is noteworthy - and alarming - that both these two religious PA officials include antisemitic messages in their teachings to the Palestinian public - 97% of whom answer in polls that for them religion is "very important." Another Antisemite in the PA with an official position is Imad Hamato, who preached hatred of Jews on his weekly program on Islam on official PA TV, and whose teachings Abbas endorsed by appointing him to an educational position, heading Gaza's Al-Azhar Institutes. Palestinian Media Watch has documented that Hamato teaches that Jews are the reason for everything that is bad in the world. He taught that "humanity will never live in comfort as long as the Jews are causing devastating corruption throughout the land... 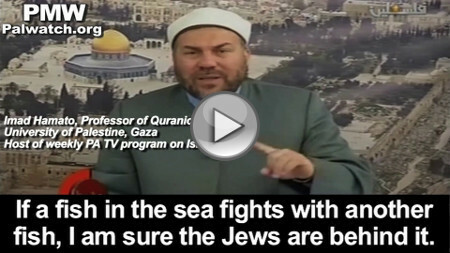 If a fish in the sea fights with another fish, I am sure the Jews are behind it." As can be seen from the opinions and teachings of these three PA religious officials, two of whom received their appointments directly from Mahmoud Abbas, vicious Antisemitism is a fundamental part of the Palestinian Authority worldview. PMW documented that Abbas' advisor on Islam, Mahmoud Al-Habbash, one of the three people cited above, preached that the current battle with Israel over Jerusalem is the beginning of the battle for the destruction of Israel and the Jews. As long as the PA teaches its very religious population that the battle with Israel is not merely over territory, but that Palestinians and all Muslims have an Islamic obligation to fight and destroy Jews - because they are responsible for all evil in the world - a peace process can never succeed, in fact, it can't even begin. PA Shari'ah Judge Muhannad Abu Rumi: "[Khan Al-Ahmar is] holy land. We know its value, and not them [Jews], the foreigners, the fabricators of history, who dance and live on the body parts of others, and on the blood of others. Read their history: There is no global corruption that they are not behind. There is no global corruption that their rabbis did not allow... People could be deluded or think... that we have no way out with the Jews... The liberation of this land is a matter of faith, which will happen despite everyone. The Jews leaving this land is a divine decree... The war is not only over this strip of land, as you all know the Jews want everything and not just a part [of it]. They want to subjugate us, and that we be slaves to their command... There have always been two camps in history: the camp of truth and the camp of falsehood. The people of falsehood see themselves as those who rule over everything... Among the Jews we find nothing but corruption and depravity."